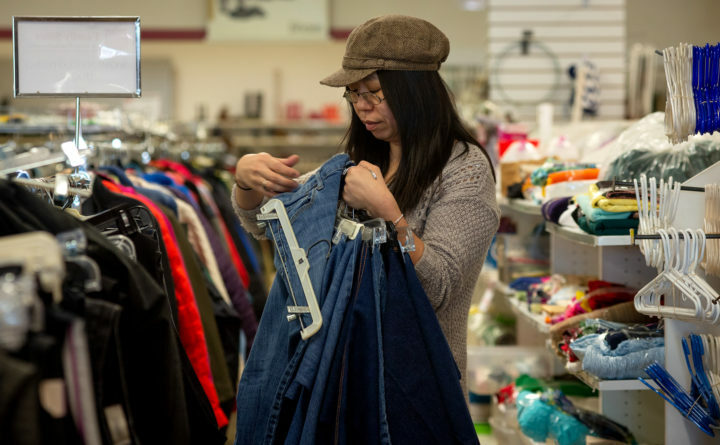 Katy McGrath, supervisor at the Salvation Army's thrift store in Bangor, organizes jeans to hang on the racks Thursday morning. The decluttering craze has hit Maine full on thanks to a new Netflix series. Organizations that rely on donated items say it could not have come at a better time. The Netflix series “Tidying Up with Marie Kondo,” launched Jan. 1. Since then, some Maine viewers have been organizing their homes while binge watching episodes. Part of Kondo’s system involves holding or touching an item and, if the decision is made to get rid of it, thanking it for the joy it has brought. Kondo recommends attacking clutter by category, not by room and breaks it down to clothes, books, papers and documents, miscellaneous items — which she terms “komono” — and sentimental items. Her system, called the KonMari system, is the topic of her bestselling book “The Life-Changing Magic of Tidying Up” released in 2014. In the Netflix series, she puts her advice into action helping folks declutter and transform their lives. Chynna Brooker, store manager at the Salvation Army’s thrift store in Bangor, hangs clothes on the racks Thursday morning. Since the Netflix series “Tidying Up with Marie Kondo” was launched Jan. 1, donations have increased around Maine. The Portland store is one of the organization’s four thrift stores in Maine that sell donated home furnishings, household goods, toys, books and other items. Proceeds from these sales helps fund Catholic Charities’ programs such as food pantries, child care, counseling and elder care. The impact of the show is particularly noticeable since donations are bucking trends this year. The first months of the year are typically slow in terms of donations, Fisher said, often because the cold weather is keeping people inside cleaning but not necessarily venturing out to donate items. Fisher credits the Netflix series with this uptick in donated items. It’s the same story at the Salvation Army’s thrift store in Bangor, where they are ready to help simplify the decluttering and donating process with tote boxes they sell for 99 cents each. 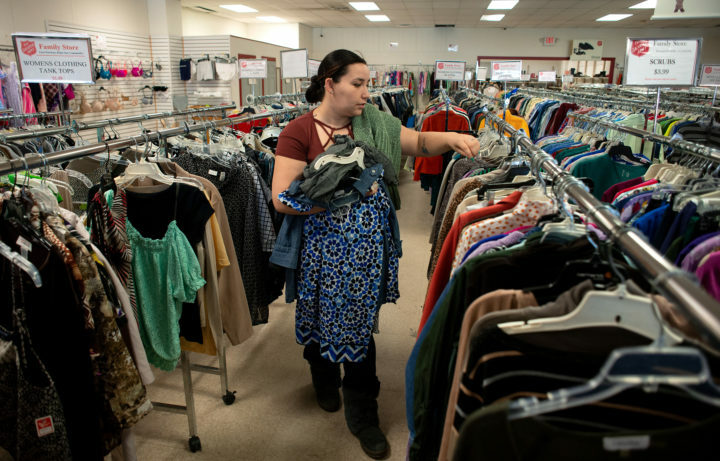 “People come in, buy a couple and then go home and use them to sort what they are getting rid of and bring those items in to us,” store manager Chynna Brooker said. 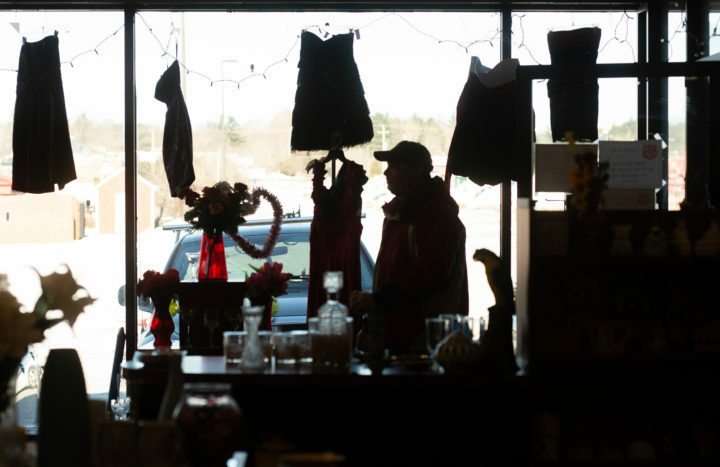 A customer enters the Salvation Army's thrift store in Bangor Thursday morning. Since the Netflix series "Tidying Up with Marie Kondo" launched Jan. 1, donations have increased around Maine. The Salvation Army totes, Brooker said, are an excellent way to separate out the unwanted items along with providing a handy container in which to transport the donations, but the totes are not required to donate items. The option of donating items is a great incentive for people looking to declutter, said professional organizer Dawna Hall, owner and founder of OrganizeMe based in Portland. Organizations such as the Salvation Army, Goodwill, the Preble Street Resource Center in Portland, Catholic Charities and Habitat for Humanity all have Maine service areas have a need for donations. Items such as clean clothing, furniture, small appliances and household items are accepted by organizations including the Salvation Army, Goodwill and Catholic Charities. Larger items such as appliances, cabinetry, doors and windows are also accepted by Habitat for Humanity Restores. Clothing items including socks, new underwear, towels, winter gloves, mittens, hoodies, jeans, rugged pants along with razors, deodorant, soap, shampoo, backpacks and duffle bags are accepted and needed by Preble Street Resource Center. 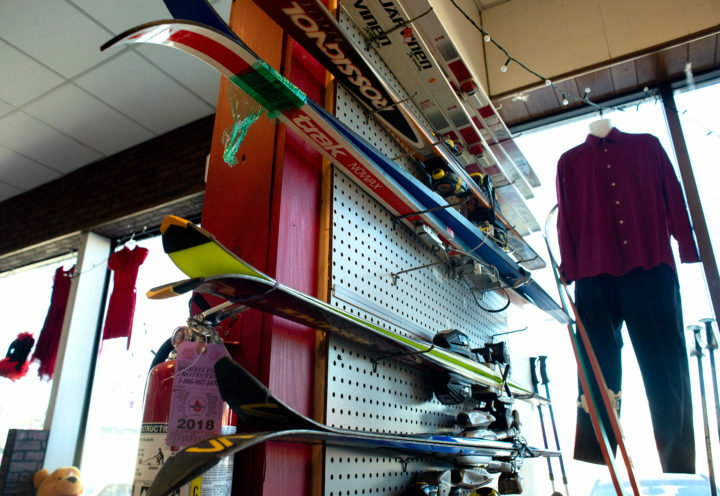 Skis are one of the many sporting good items for sale at the Salvation Army’s thrift store in Bangor. Have shampoo or soap that’s opened? Salvation Army accepts “health and beauty items as long as there is still a usable amount in the container,” Brooker said. Threads of Hope also does not accept cribs, child car seats or bicycle helmets, which may be damaged or have specific consumer or government safety ratings that may be expired. At the Salvation Army, the organization does not accept outside children’s toys that are broken, rusted or unsafe to use. If people have questions on what to donate where, Hall’s website at www.organizemaine.com contains a list of organizations and their wish lists.